We want to help you identify the real signatures. We realize that this may look a little bit "popular" but we felt that is enables easy and quick identification. 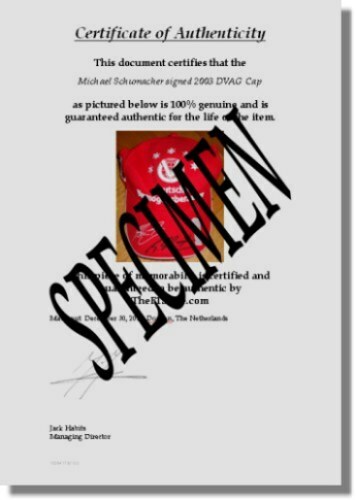 The certificate clearly shows the item description (for example "Michael Schumacher signed 2003 DVAG cap"); repeats that the item is guaranteed to be authentic and warranted for life; shows an image of the item in question so that it can not be abused for selling another item; is dated on the day of sale; is numbered and a digital copy of it is maintained in our archives for future reference. The certificate is signed by myself as I am the person that supplies you with both the item and the lifetime guarantee and therefore the sole person responsible for it.